The sun shone over Aldenham in more ways than one on Sunday 11th June 2017. The weather was glorious and smiles wide, as 149 people gathered from all over the World, for OA Day and a Paull’s House reunion. Travellers came from Singapore - Dr Michael Vatikiotis (SHE1971-75), America - Harry Hedaya (formerly Murtaza Hidayatallah) (P1981-85), Bulgaria - Duncan Wallace (P1963-66), Switzerland - John Miller (P1971-75) and Germany - Carola Neuhaus (P2005-06), as well as from Devon, Gloucestershire, Hampshire, Suffolk, Cambridge and the Home Counties. The OAs present ranged in age from 18 to 94, with Philip Osmond (P1938-43) being the oldest ‘Pauline’ on the day. 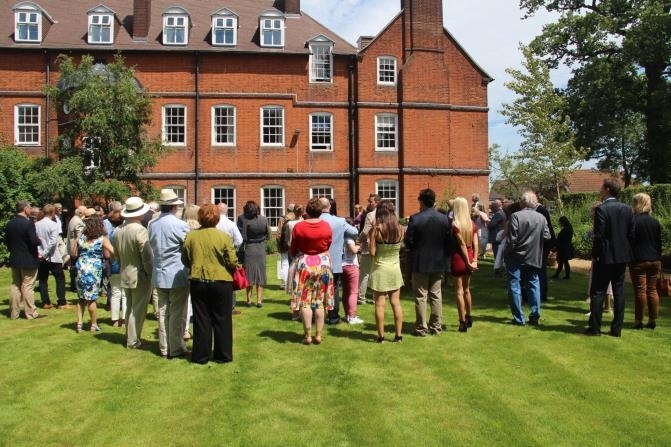 As Paull’s has been an all-girls House since 2009, all old girls had been specially invited to the reunion. It was a particular delight to welcome Masume Hidayatullah (P1980-82), who was among the very first girls to come to Aldenham as Sixth Form students in 1980. The occasion also marked the next stage of development in girls’ education at Aldenham, as Ridings will become a girls’ day house in September 2017. Still the majority of Paull’s OAs are men however and the guest profile reflected this, some returned to Aldenham this year for the first time since they left as teenagers. After coffee in The Wells Centre, which many remembered as the Tuck Shop, and an opportunity to visit Paull’s House, a thanksgiving service was held in Chapel. This was followed by drinks in Paull’s House garden and then a delicious Lunch in the Dining Hall. In the afternoon, as the sun continued to blaze, guests enjoyed the beautiful school grounds and gathered for tea by the cricket Pavilion, where the John Dewes match was in full swing. A selection of delightful pictures taken on OA Day is available to view in the Event Galleries.